Time and place stir up striking thoughts during this time of year as we search ourselves for what we’re thankful for. Rather than leeching onto the vein of treachery that pumps through the world, this writer has contrarily used his time by counting the choice blessings of living in Salt Lake City. Most notably on this front, we are experiencing a culinary revolution, which on this same note reads: Post Office Place has been delivered. The alley of Market Street Downtown has contemporarily been associated with an immersion of all things good in the SLC food scene. Ask most anyone around where the sushi fix is, and the answer will always be Takashi. With intrinsically creative restaurant owners like Tamara and Takashi Gibo, it was only a matter of time before they would acquire the space next door to expand their legacy. Digging deeper into Takashi’s roots, Post Office Place has all the colorful flavor spectrums of Japanese, Peruvian and French fusion, disguised in crisp-white lines and minimalistic ambiance on micro-dose psychedelics. 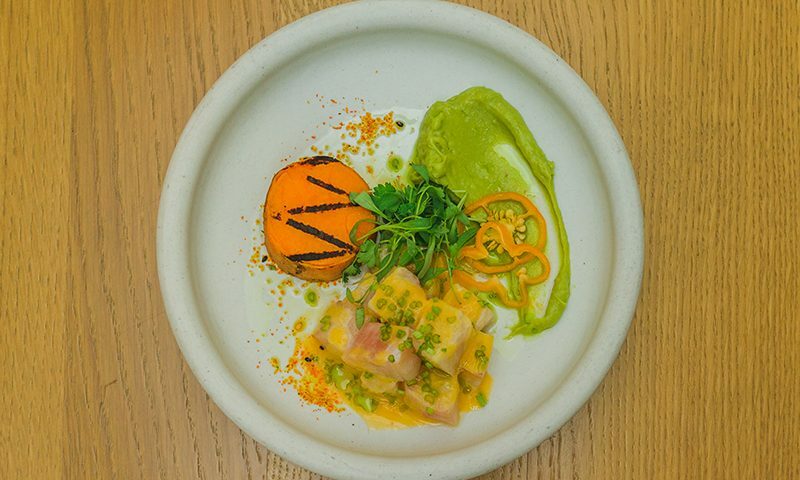 This is the appropriate way in which to play off of flavor palettes by ordering cold plates like Hamachi Ceviche ($10) and the Chicken Liver Pâté ($10). These plates pair well with the Mizuwari Toki cocktail at the bar ($10). Noteworthy for Post Office is their extensive use of Japanese sodas, liquors and, most importantly, “whiskies,” where the idea of whisky as a product spans many countries, attributing them to their respective names and deliverances. The Japanese have taken the best aspects from all styles and shaped whisky profiles never before seen. The Antichucho. Photo: Talyn Sherer. The Mizuwari cocktail has a cleansing effect on what’s to come, combining the Toki Whisky by Suntory with Genepy des Alpes (Chartreuse) and soda. Diving headfirst into the pâté is recommended, as its buttery-iron-rich flavor meets a thin layer of Japanese-whisky-gelatin spread over baguette crackers, purposely delivering an immediate, sensory overload to the tastebuds. 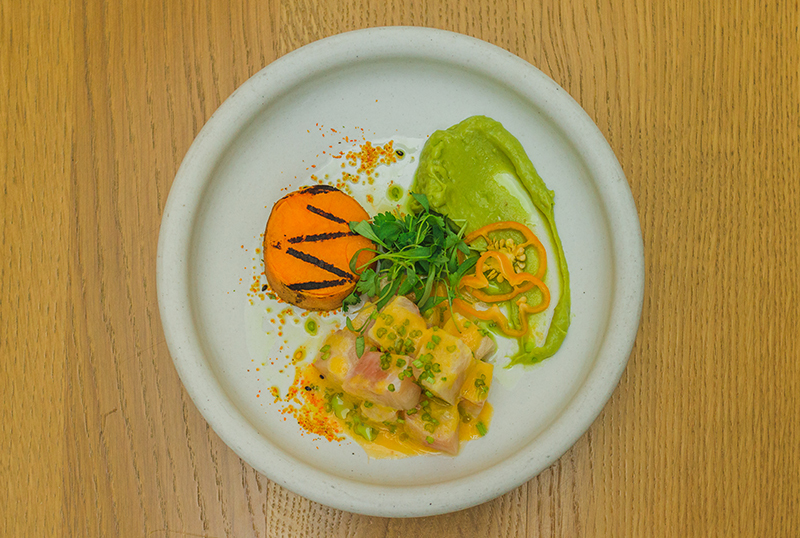 It is almost genius to go right into the Hamachi ($10), based off the traditional ceviche marinade of leche de tigre. The fish is raw and marinated in lime juice, red onion, cilantro and aji amarillo peppers. The element of fruity acidity in this dish acts as a neutralizer to the heavier overtones of the liver with harmony. At this point, the red onion and thinly sliced peppers act in place of what ginger does to sushi, offering a spicy equalizer and what older generations call “a coming to Jesus.” As the Mizuwari brings all of these sensations to a sound stability, the guest is able to continuing riding this roller coaster until nothing remains on the plate. As is any properly run kitchen should, Post Office Place unpretentiously boasts using all aspects of the the animal, creating both culinary creativity as well as a food-conscious environment. In this capacity, the diner is able to experience the textures and flavor profiles less in touch to Western norms. To the effect of hot dishes and organ meat, Anticucho Al Corazòn ($10) is one for the books. Marinated in a dark aji panca chili paste then grilled, this beef heart is given a perfect outer char and pulled off the flame just in time for inner tenderness. As simple as it seems, the heart is the most used organ in the body and one of the more difficult cuts of meat to avoid overcooking. 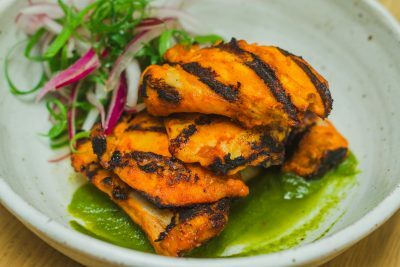 As a nod to the animal, head chef Tommy Nguyen has used his years of experience to grill the heart to perfect tenderness while delivering a mild but bold, smoky spice tinge to the plate. As with the ceviche, this dish comes plated with a small salad of pickled scallions and red onions, used both to bolster the complexities of Peruvian chili paste and add sharp-crispy accompaniment. While this is maybe one of the more popular dishes on the menu, those wishing to have a less adventurous cut of meat laid before them may also choose the Anticucho Al Pollo ($8). In a certain respect, the chicken is just as expertly crafted and served with a chimichurri cilantro smear of sorts. Both are delicious. Working again with the light and dark sides of taste, the Little Bird ($11) should be ordered at the bar to join this dish. A combination of Manzanilla Sherry, Kiuchi No Shizuku (distilled white ale cask-fermented with coriander, hops and orange peel), Calpico soda, lemon and yuzu. Working with all of the earthy profiles from the meats and marinades, the Little Bird brings to the softer, fruitier edges to the table. Where many restaurants in Salt Lake City can be called exceptional, Post Office Place is extraordinary. Whether it’s the largest Japanese liquor and beer selection in the state or that they’re reminding this generation of the Japanese influence on Peruvian culture, it is commendable and executed with precision. We can all be thankful for that influence.